held through the years in various locations in the United States and in Germany. 2011 Family Reunion in Sonneberg, Germany: Jan reports that 24 Bowersox/Bauersachs kin had a wonderful adventure in Europe in July 2011. The trip started off in the Netherlands where our ancestors left to sail to the U.S. in the 1700s. The journey ended with a delightful and very wonderful reunion in Sonneberg, Germany. There were stops in Amsterdam, Rotterdam and Delft in the Netherlands. Then on to Brussels and Bastogne Belgium, Luxembourg and Strasbourg, France as the trip continued on into Germany with stops in Tubingen, Ulm, Munich and Rothenburg. Our reunion weekend was hosted by the Bauersachs families in Germany. Our first stop was the Bauersachs Brewery in Sonnefeld followed by a family get together at the Schlossberg Hotel. Tours were planned in the local area on Saturday. In the evening we had a festive banquet which included fabulous meals, lovely music, our kazoo band and dancing to the sound of elderly Horst Fischer's accordion. 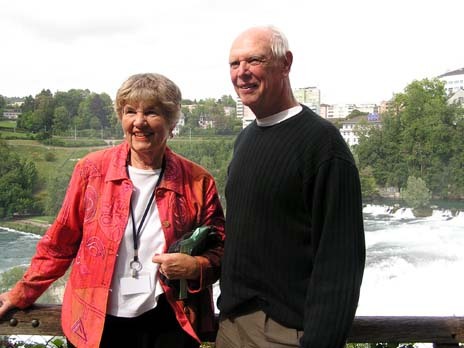 Recognition with thanks was given to Tom Bowersox, founder of both the genealogy group in the U.S. as well as the group in Germany. Tom passed away on December 15, 2010. On Sunday, we worshipped at St. Nikolas Church in Judenbach which dates back to the 1400s. Communion was served from the original chalice. Carolyn and Cathy sang beautifully and Gary rendered lovely music on their Bach organ. Jan presented a monetary gift to the church in Tom's honor. At lunch at the Forsthaus, we were joined by the mayor of Judenbach and his wife. After lunch with numerous "good bye's" our bus and wonderful driver/guide whisked us back on the highway through Coberg, Bamberg and Wurzburg to our final destination in Frankfurt. Here we spent the night before our flight back to the States. Here's a link to a PDF document: news article that appeared in the Sonneberg newspaper in Germany in regard to the Reunion. I hope you have taken time to read the "travelogue of the daily adventures" provided by Kathy Bowersox Hutchens in the last newsletter from Jan. Here's a link to some photos which Jan has shared. THANKS to Sue Bowersox Anderson in coordinating our adventure daily and to Carolyn Baldwin for directing the Kazoo band. Also, THANKS to the German Reunion Committee planners for a delightful weekend party. 2010 Bowersox Family Reunion was held in Middlebury, IN at the Essenhaus Inn & Conference Center. The Inn and Center offered an excellent venue for the family reunion with plenty of space and delicious food for some 80+ family members who attended. As one family member writes: ".... I hope that everyone had an uneventful, pleasant trip home and enjoyed the reunion as much as we did. Thanks to all of you for the scheduling, arrangements, organization and 'pulling off' another memorable Bowersox Reunion. We enjoyed so much the fact that we had time to meet and talk with family and still had some time to 'explore' and relax on our own. The setting at Essenhaus was great, the food was excellent and your hospitality was outstanding." at Hotel Schlossberg in Sonneberg, Germany. See More Pictures from Gettysburg. 2007 International Bauersachs Family Reunion: Family Reunion Tour 2007 website. (Follow this link to view photos of the trip to Germany submitted by various family members.) See Slideshow here! The 2007 Family Reunion & Group Tour included 32 family members from the US. We enjoyed stops in Rothenburg, the Reunion in Coburg (Bauersachs historic places in Memmelsdorf, Welburg, Sonnefeld, Furth am Berg, Judenbach), Munich, Innsbruck, St. Moritz, Glacier Express Train to Zermatt, Rhine Falls, Freiburg, Strasbourg, Heidelberg and a Rhine Cruise from Rudesheim. The tour was from Wednesday, July 25 to Monday, August 6, 2007. 2005 International Bauersachs Family Reunion: The 2005 Bauersachs Family Reunion took place on July 22-26, 2005 in Germany. 2004 International Bauersachs Family Reunion: The 2004 Bowersox/Bauersachs Reunion was held in Gettysburg, Pennsylvania, on July 22, 23, 24, 25. Family members visited many historic landmarks during their stay in Gettysburg and enjoyed several of the historic tours (walking and bus). 2001 International Bauersachs Family Reunion was held in Germany. The Newsletter indicated that a good time was had by all. 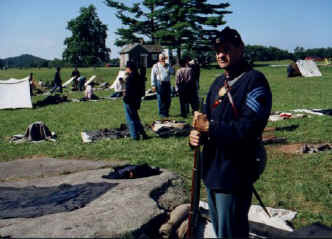 Photo by Larry Bowersox - Aug. 2000 Year 2000 International Bauersachs Family Reunion: The 2000 Bauersachs Reunion in Gettysburg, PA., on August 4, 5, and 6 was a success with beautiful weather and approximately 150 family members in attendance. Not only is Gettysburg one of the most famous battlefields of the Civil War, in which 13 members of the Bauersachs family fought, but it is also close to many Bauersachs family homesteads. 1999 International Bauersachs Family Reunion: The 1999 Family Reunion took place on July 30 to August 1, 1999, at the Border Inn, Furth am Berg, Germany, near Coburg. 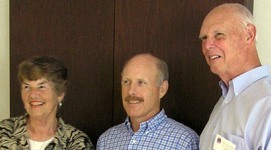 Tom and Jan had a nice report of the trip and reunion in the newsletter. 1998 International Bauersachs Family Reunion: The 1998 reunion was held at the Abe Martin Lodge, Brown County State Park, Nashville, Indiana (South of Indianapolis) the weekend of July 31 to August 2, 1998. In attendance were many family members from several of the 50 States and a young couple from Germany as well. The infamous Kazoo Band performed at the Banquet on Saturday evening. A memorable time was had by all. The annual membership donation is $15.00. the family tree or would like to receive the newsletter. The phone number is: 858-673-3750.